South Korean investors’ purchase of foreign securities reached a record high of $109.7 billion last year as they have actively sought for alternative to Korean stocks that were heavily battered last year due to concern over the country’s economy and company earnings. Korean investors’ purchase of foreign securities in 2018 jumped 13.7 percent to $109.7 billion from $96.5 billion in 2017, according to data released by the Korea Securities Depository on Friday. Local investors bought $32.57 billion worth foreign stocks in 2018, surging 43.4 percent from the previous year. Their purchase of offshore bonds also rose 4.6 percent to $77.15 billion over the same period. By region, the largest purchase was made in the European market at $66.06 billion, followed by the U.S. at $33.19 billion, Hong Kong at $5.24 billion, Japan $1.71 billion and China $1.53 billion. The favorite U.S. e-commerce giant Amazon whose stocks attracted $2.35 billion last year from Koreans, compared with $610 million in 2017. China’s tech giant Alibaba came in second with $1.16 billion, followed by Tencent with $930 million, Nvidia $810 million, Alphabet A $720 million and Netflix $560 million. 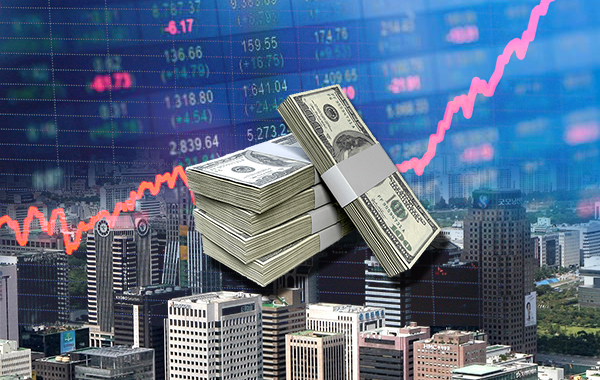 The value of foreign securities held by Korean investors amounted to $36.28 billion as of the end of last year, down 3.1 percent from the previous year. Local investors’ holding in overseas stocks rose 2.1 percent to $9.84 billion, while those in foreign bonds fell 4.9 percent to $26.44 billion. Local investors developed strong appetite for the Vietnamese market, with their purchase in Vietnamese securities soaring 185.2 percent on year to $770 million and bonds 90.5 percent to $400 million. Korean investors’ flight to overseas securities coincided with excessive losses in local securities mainly driven by growing concern over a slowdown in the country’s economic growth and a retreat in corporate earnings. Korea’s main Kospi index closed year 2018 with a 17.3 percent slide to 2041.04 from late 2017. The junior Kosdaq also declined 15.4 percent to 675.65 from a year earlier.